Calling all creative, curious, analytical, and detail-oriented individuals: if you have a desire to improve quality of life through designing the infrastructure that supports our civilization, then civil engineering may be a good career fit for you. 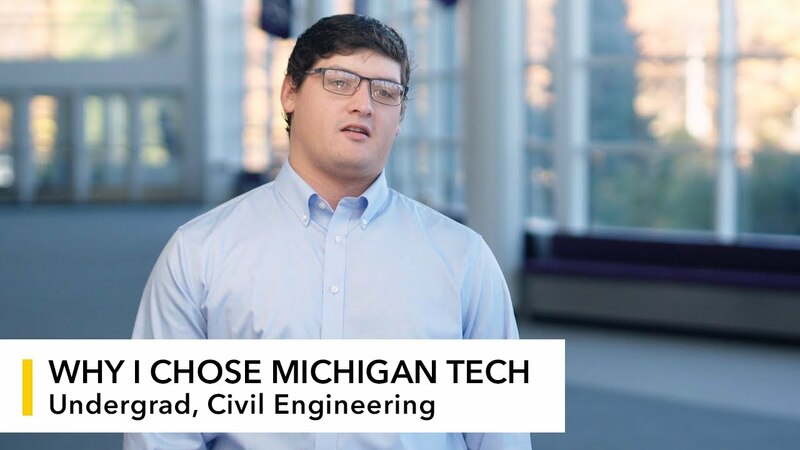 Be prepared to tackle the engineering challenges of our society head-on with a bachelor’s degree in civil engineering from Michigan Tech. Civil engineers are the people’s engineers. These professionals are responsible for planning, designing, building, and managing civil structures including roads, buildings, airports, tunnels, dams, bridges, water supplies, and sewage systems—addressing the modern needs of a growing global population. They engineer sustainable solutions to deteriorating infrastructure, traffic congestion, society’s energy needs, pollution, urban redevelopment, community planning, and risks posed by natural hazards such as floods and earthquakes. The field’s contributions are evident in the designs of monuments such as the Hoover Dam, the Interstate Highway System, the Golden Gate Bridge, the Panama Canal, and the Empire State Building. Our state-of-the-art facilities allow students to experiment with civil engineering materials and advanced technology. The department maintains a pilot-scale environmental simulation lab, as well as labs dedicated to the study of asphalt and ultra-high-performance concrete. Get ready to contribute on the job from day one. Our students benefit from hands-on experiences ranging from Senior Capstone to internships and co-ops. Our department has one of the highest co-op rates on campus, due to the great demand for our students. Many civil and environmental engineering majors land summer internships. Opportunities for intercultural exchange abound at Michigan Tech. The Study Abroad Program sends students to countries around the world for stints ranging from two weeks to one year. The D80 Center allows students to apply their engineering studies to the problems facing economically disadvantaged communities. D80’s service-learning programs include Engineers Without Borders and International Senior Design, which are vehicles for sustainable development, appropriate technology, beneficial infrastructure, and social change abroad. Our staff and nationally recognized faculty focus on giving students the personal attention and support necessary for not only academic success, but also a positive undergraduate experience overall. The innovative Rail Transportation Program is one of the first in the nation. Its mission: to advance rail education and research across disciplines. Its unique opportunity: a five-week railroad course, including three weeks in Finland. What career pathways are a good fit for our graduates? Students who graduate with a bachelor’s degree in civil engineering are prepared to transition directly to entry-level jobs in industry. As a civil engineer, you could serve as a design engineer for a consulting firm; an estimator, planner, or project manager for a construction company; or a municipal engineer. You could also become a high school teacher of science and math; go on to law school; or head to graduate school. Students interested in a career in academia should explore graduate education options. Where have our civil engineering graduates found employment?